I have been working at Edgetech, the driving force for energy efficient glazing, since 2007, when I joined as Marketing Assistant. In 2014, I moved up to Marketing Manager and was made Head of Marketing at the FIT Show 2016. I’m passionate about marketing. It can have a very fluffy reputation but I take a statistical approach to what we do. In our strategy, we use measurable marketing methods so that we can gauge our successes and see where there is room for improvement. We plan everything ahead and have found some really clever marketing automation systems that help our small marketing team (just Krishma and me!) to work smarter and get better results. We work very closely with our sales team. I was responsible for implementing the Salesforce system in the UK office and have been the driver for us continuing to develop what we can do with it. I read an article in the Harvard Business Review recently about the importance of sales and marketing teams working together. Studies have found that aligning these two departments can ‘improve sales efforts at closing deals by 67% and help marketing generate 209% more value from their efforts’. We have seen improved results and return on investment since we have been working more closely with the sales team, and better return on investment is definitely what I want to see happening as Head of Marketing. During my role in marketing at Edgetech, we have brought warm edge technology, Window Energy Ratings and triple glazing to the top of the agenda in the glazing industry press. By being the driving force for energy efficient glazing, we have been able to build our reputation in the industry through communicating our key brand messages through strategic PR and advertising with the glazing press. Having a product like Super Spacer® gives us so much to talk about in our marketing. As well as its impressive thermal performance, the flexible spacer bar gives so many more benefits to IGU manufacturers, like increased productivity. I look after all external communications, to make sure that everything we say to the outside world is said in the best way, via the best channels possible. We create a bi-annual printed newsletter and email our customers regularly to keep them up-to-date. A quarterly customer survey is conducted to make sure that we are offering the very best product and service to our customers. With the massive increase in online activity, social media and website management has become a huge part of my role. We make sure that we are creating interesting, SEO-rich content on our blog and use Twitter and LinkedIn to engage with our customers and the wider industry. Marketing a product becomes easier when it’s as good as Super Spacer. When you have a truly unique and successful product it’s inevitable that it will be copied. And although we have some competition now, we still have plenty of inimitable selling points that make Super Spacer the number one choice. Testing – Super Spacer may only be a small component of a unit, but it is a very necessary one. It has been tried and tested globally in the field for over 25 years and is backed up with our unrivalled 40-year guarantee of product performance. Secure Supply – We stock Super Spacer at our manufacturing facility in Coventry and our UK distribution centre. We also manufacture in Germany and the United States which gives an extra supply back-up so customers can trust us to deliver consistently. Innovation – Edgetech really invests in research and development, both in products and IGU machinery to help companies to future-proof their businesses. High speed machinery and our flexible spacer bar continue to push the boundaries for productivity. Before I started, Edgetech held the first Window Energy Ratings seminar in 2006. The event, ‘Increase your Profits: Energy Efficiency in Focus’ brought together 223 key industry decision makers. It was a real success, fuelled with debate and predictions. Three years later, we held another seminar – ‘Edgetech: Energy Efficiency in Focus: Revisited’. It was the first one I was involved in and looked at how things had changed since 2006. It included discussions on what had changed with WERs, the 2010 revision to Part L of the Building Regulations and how the industry would cope with the looming recession. We held a series of ‘Journey to C’ workshops across the country in 2010, which helped companies to get ready for the revised regulations, where, as predicted by the 2006 seminar, ‘C’ WER became a route of compliance for replacement double glazing. In 2014, we launched the Triple Glazing Question to the industry. Another Edgetech event that brought together key industry figures to talk about a growing trend and how it would influence the market. The event dominated the trade media for six months afterwards. We’ve always been big supporters of the FIT Show. 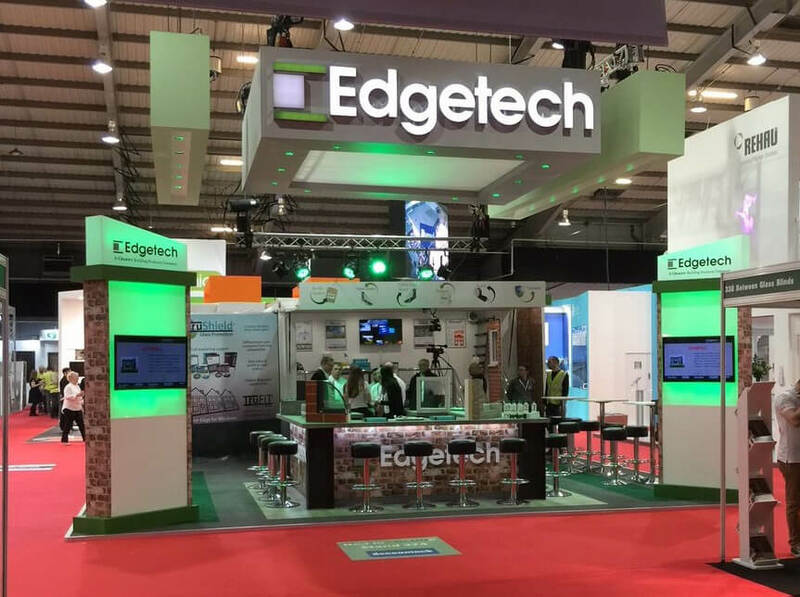 Edgetech, the driving force for energy efficient glazing, exhibited at the FIT Show 2013, 2014 and 2016. In 2013, we joined the inaugural show with a bang! We were celebrating our acquisition by Quanex as well as launching our new rigid spacer bar, TruPlas. We had a double-tier stand which worked perfectly for us – keeping business downstairs and hospitality upstairs. The most recent event was the best yet as we had a product to offer for everyone who visited. I was pleased with how our stand turned out, with lots of interactivity and live demonstrations which drew lots of visitors to us. It was a successful event for us, especially our TruFit® tongue-in-cheek Gun Amnesty which was a real hit with window installation companies. At the FIT Show 2017, TruFit expanding foam edge tape will be featuring as part of the Master Fitter Challenge in association with Glazpart. 2017 is also the 10th anniversary of Edgetech manufacturing in the UK, so at the moment we are busy making preparations for our celebrations! I’m proud to work for Quanex because it is a dynamic organisation with great products for energy efficient glazing and a talented and passionate team. It also brings lots of variation to my role. I work closely with my marketing colleagues at Edgetech in Germany and across the pond in the US on larger joint projects. We then take those plans and ideas and localise them so that they are relevant in the UK. I was promoted to Head of Marketing in April 2016, so this year is the first time that I have had total responsibility for the marketing strategy going forward. I have spent lots of time analysing the success of past years and planning our activities going forward so that we can get even better results in 2017. One of the first things I was involved with as Head of Marketing was the launch of our new website in April. The work hasn’t stopped yet and we’re working on phase two of the site, so that we can bring more support to our sales team and to all our customers, so watch this space!